The 2015 Journal Citation Reports have just been released and we are pleased to announce the Journal of Population Economics’ new impact factor: 1.139. 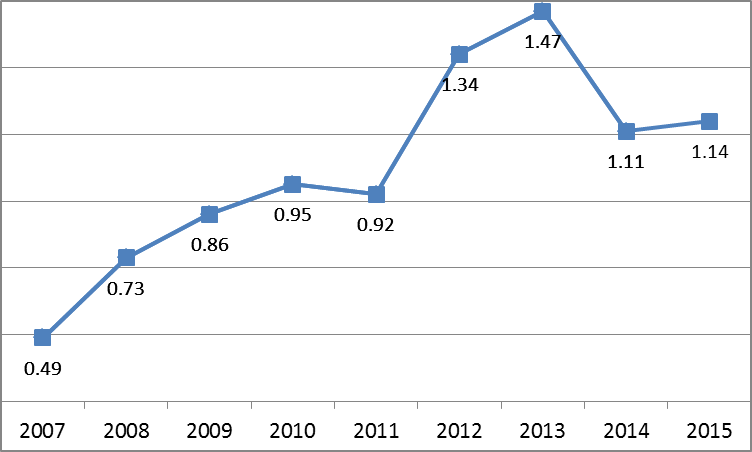 The impact factor has increased continuously since 2008 and peaked at 1.47 in 2013, and after an IF of 1.109 it reached 1.139 in 2015. The Journal’s 5-year Impact Factor reached 1.509 in 2015. The Journal now ranks 126/343 in economics and 16/26 in demography and is currently among the journals listed on SSCI (IF 2015). Furthermore, as of June 27, 2016, the Journal’s IDEAS/RePec ranking is 70/1,661 (based on the Simple Impact Factor, for Journals). Further Ranking details are available here. The Editor-in-Chief Report of the Journal of Population Economics, which has been discussed at the Journal’s Editorial Board Meeting and presented at the General Assembly of the European Society for Population Economics at its 30th Annual Conference in Berlin, can be accessed here: Editor-in-Chief Report 2016. The Report provides information on the Journal’s performance ranging from submission numbers and acceptance rates to international access and more.